Heated seats are a comfort and convenience feature today's drivers expect in many of their vehicles. Now everybody can enjoy this marvelous luxury option at a very affordable price. 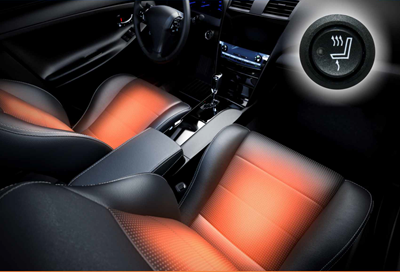 Correctly installed from Jackie Cooper Tint & Electronics, or seat heaters will radiate comfort and warmth for years to come! Heated seats can be added to almost any seat in any car - cloth, leather, or suede. The heating elements are installed between the seat cushion and the cover of the seat, allowing the heat to be closer to your body which results in warming up faster! The switch can be installed almost anywhere, depending on customer preference. The seat heaters have two different temperature settings that allows you total control. They also have safety features built in and a one hour shut-off timer for your protection. Our seat heaters offer the option of being synchronized with our Viper remote start systems to automatically come on when the vehicle is remotely started, resulting in total comfort when entering your vehicle on a cold, winter day.